Washington Services mainstay convenient for games at the Stadium of Light and Newcastle Metro Centre. Practical for Holidays North and South of the English Border. Holiday Inn have an endearing and profitable habit of building hotels in fast growing, high turnover environments and this Washington property is no different. Efficient, practical and implausibly practical for stopovers on the punishing journey North and South of the border. 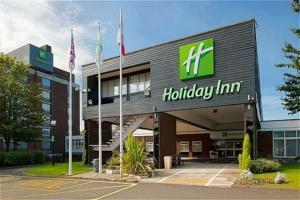 The hotel sits off Junction 64 of the M1 just a short drive from the Metro Centre. The hotel enjoys all the facilities and travel options of Washington Services practically on site including a WH Smiths, children's playground, Burger King, Costa Cofee, and picnic areas. Executive suites and floors available. Excellent motorway location between Sunderland, Durham and Newcastle. Ideal for the long trips North and South of the English and Scottish Borders. 'Traders Restaurant' opne to Holiday Inn guests. Convenient for Newcastle Metro Centre and games at St James Park. 40 family rooms with inter-connecting rooms available.